GOT SOME INVITES TO SHARE WITH YOU ALL GOOD USERS !!!! NO CHEATERS NO COLLECTORS ! give me some ratio proofs dated today and a speedtest "forum link"
also i will like to hear from you why the hell i should give you an invite to this site ! oh yeah and one more thing : NO PM !!! Last edited by zedex; 01-03-2008 at 11:17 PM. Last edited by Explosion; 01-03-2008 at 11:21 PM. Last edited by ChelSea; 01-03-2008 at 11:47 PM. May I have TheVault pls? You can see I'm a good sharer, not a leecher, I'll only do good to the community there. 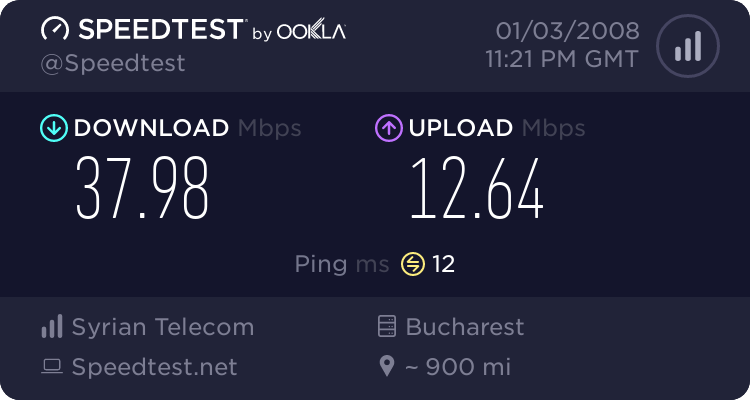 My internet connection is 24Mbps/1Mbps is the speed test reaaallly that important? Because in my country it gives lower speed results than those I can really get. (I can get 1.3MB/s DOWN and 110KB/s UP). Last edited by max59x; 01-03-2008 at 11:48 PM. I would like to apply for RevTT invitation. Because since TL closed invitations, there's no way to get there (lol, I remember, when I used to giveaway 'em by 4's and noone wanted ) and trading for account isn't nice, also i don't have account on SCT and need some good general purpose tracker for 0-days and so. REVTT seem to be nice and have plenty of users, I don't care much about the levels, so that what I need. Also my ratios are good and I promise never cheat or trade this account, and only use it for myself and also, when I'll become a PU there - will share the love and invite some more good people from FST there.